Home / The Archives / The 2013 CommuteByBike.com Holiday Gift Guide! The 2013 CommuteByBike.com Holiday Gift Guide! Its that time of year again. That time of year for wallowing in the gift giving ambiguities of consumerism, generosity and self-interest. We are here to help you through this mess with some clear and concise holiday gift related strategies. #1: Consumerism: Attack this problem head on by tying consumerism to products that help people lead better lives. Sturdy and rugged bike commuting products might just fit the bill. #2: Generosity: Be generous to those who deserve it most. We think the bike commuter in your life deserves some generosity just because they are always in such a good mood after a good bike commute. #3: Self Interest: Suggest to your family and friends through social media that a bike commuting related gift would be something that would brighten up your holidays. With that, here are 11 Great Gift ideas for this upcoming holiday season. We are not just messing around here! Are you serious about Commuting by Bike? Orlieb’s Downtown Commuter is the bag that says you are serious both on the road and when you get to work. Ortlieb makes an amazing collection of bike bags for commuting and touring. We’ve got the entire collection of All Ortlieb Bags, Tubus Racks and Racktime Bags and Racks at 10% through Dec. 7th! Thule Pack ‘n Play Tour Rack. Go on Tour, like a Rockstar! Are you communing through the Colorado Rocky Mountains or busy city streets every day to work? Yes? Then check out the Thule Pack ‘n Play Tour Rack. The Tour Rack works on nearly any bike from Full Suspension to Carbon Road bikes. At 20% off this rack makes the perfect gift. All Thule Bags and Racks are 20% off through December 7th! The Chrome Falcon Bike Backpack lets you haul everything you’ll need for the day at the office or at school and keep it organized. The Falcon is built for toughness and everyday use. The only problem withBlack Friday to Cyber Monday only! the Falcon is that it lasts and lasts and thats a good problem to have. Did I mention they are made from the toughest materials Chrome could find? At 20% off check out our current line up of Chrome bags today! All Chrome is 20% off this Black Friday to Cyber Monday only! Light and Motion Urban 700 Bike Headlight. The Light and Motion Urban 700 Bike Headlight is a great choice for ANY cyclist. This light can be used day and night to help increase visibility and can be used year round. This light can be charged anywhere that has a USB plug, so you can charge it at work, at home or your favorite coffee shop. All Light & Motion is 10 to 50% off 2013 and 2014 while supplies last! Looking for a good pair of Panniers? Check out the Vaude Roadmaster Rear Panniers! They are sturdy, lightweight and fantastic for everyday use. These panniers have 48 litres of room to pack all your stuff. It’s now up to you to decide which kitchen sink to bring. Save 35% on ALL Vaude Cycling Bags – this Black Friday to Cyber Monday only! The Croozer Kid for 2. Mommy, Daddy, Can we go for a bike ride? The Croozer Kid for 2 is ready for the road because it comes with everything you need. A Cycling kit? Yes! A Stroller kit? Yes! A Jogging kit? Yes! All three kits for $329.99! The Croozer Kid for 2 is an amazing deal and is affordable. Did I mention that how easy it is to swap back and forth between kits? No? Well it’s super easy to transition between kits! 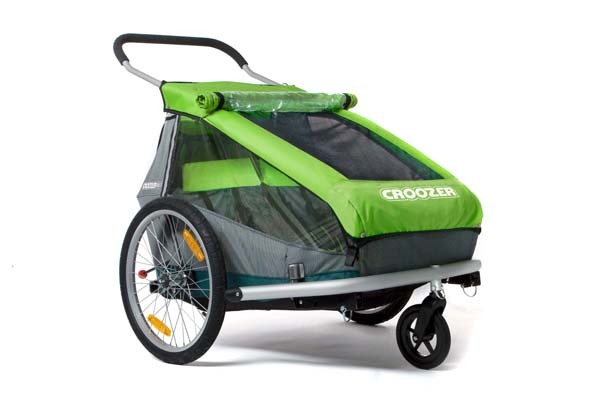 All Croozer Child & Dog Trailers are 20% to 25% off while supplies last! Light up the sky and possibly the entire universe. The CygoLite makes some of the best light kits available and the Centauri 1500 OSP Rechargeable Headlight is one of them. This Powerful Headlight and Taillight is USB rechargeable and helps give you confidence that you’ll be visible to motorists day or night. Save 20% To 40% on 2013 Cygolite Bike Lights while supplies last! This Hydration pack doesn’t bite. Osprey is known for great hydration packs and the Viper 5 backpack is an excellent choice for a gift this holiday season. The Viper 5 is designed for Lightweight performance while Mountain biking, Trail running or day hiking and it contours to your back, so it doesn’t feel like you have 100 duck sized horses on your back. All Osprey Packs – 30% this Black Friday to Cyber Monday only! Burley Travoy Bike Cargo Trailer. Trust me, it will fit. The Burley Travoy Bike Cargo Trailer can be used as a shopping cart, messenger bag and briefcase all in one. The Travoy makes a great gift because it is extremely flexible and quickly adapts to your needs. So if you need a trailer to carry School books, golf clubs or a vacuum then this trailer is perfect for you. All Burley Child, Cargo & Pet Trailers are 15% off this Black Friday to Cyber Monday only! Was 109.00 Now 98.99! This Friday – Monday Only! The Strider ST-4 can be considered a gateway drug into cycling. The Strider ST-4 helps kids as young as 18 months get hooked on two wheels and racing around the neighborhood or local park by teaching them the fundamentals of balancing, leaning and steering without the difficulty of pushing down on pedals. Striders unique approach to learning how to ride eliminates the use of training wheels when they transition to a bigger bike which is why this is a great gift. Striders are 10% off this Black Friday to Cyber Monday only! The Grocery will never know what hit them. The Xtracycle FreeRadical Cargo Bike Kit lets you carry nearly everything you need in your daily life. Got a surfBoard? no problem thanks the the Xtracycle LongLoader or select the passenger accessories and throw the kids on the back and take them for a spin. The XtraCycle is so Versatile that you could sell your car and just ride your bike forever and ever! Shop Xtracycle! Don’t forget we have many sales still available for you to take advantage of. Most sales are just running Black Friday to Cyber Monday, though a few will be extended beyond. Check them out! 10% off: Ortlieb, Tubus, Racktime, Adams, BOB, Extrawheel, Wandertec & Strider! 20% off: Chrome, Weehoo Classic, TimBuk2, Chariot, Thule, Velo Orange and Croozer! Thanks for checking out our Holiday Gift Guide and supporting CommuteByBike.com by supporting the business behind it, www.bikeshophub.com. Shop or Share on Twitter or Facebook, your support makes this bike commuting business work! Happy Holidays and Happy Bike Commuting! I cannot give any personal endorsements to the items on the list because I have not used them (maybe in my dreams). I have used Cygolite’s Expilion series 410 light with a Metro 320 light in combination for my commutes. The 600 Expilion is now selling for the same price that I bought my 410. A 410 Metro is selling for a little more than my 320 cost. No complaints, I am happy with my purchases but it just go to show how quickly technology is improving at reduced prices. Sooner or later, one has to make a purchase decision (and a safety decistion). The 410 worked well for about six months and stopped working. Cygolite provided prompt service under warranty and it has not had any problems in the 11 months since the repair. Stuff happens. That said, I was delighted to find an American manufacturer that stood behind their product and delivered reasonable service in a reasonable time period. I complimented it with a Metro light 320 so that if one light should fail or not work due to my lack of charging, I have a worthy fall-back system. A cyclist can never have too much light when it is dark and raining. I would not hesitate to add them to any wish-list for my fellow commuters. I enjoy reading other people’s commuting experiences and I wanted to contribute in a small way. It’s a shame not to see velo transit on here. They have quality bike bags that are made in the USA.